I'm pleased to announce that a limited number of exclusively designed RUN GEORDIE RUN t-shirts will soon be available to buy. Details are currently being finalised but I'm hoping that after production costs, at least £6 will be split between St Benedict's Hospice and The Children's Foundation for each t-shirt purchased. I haven't seen the final design yet but I can tell you that the RUN GEORDIE RUN logo will feature on front and back. The 2 charities logos will be on the front with details of the 3100 mile run across the USA on the back. Please get in touch if you are interested in buying this season's "nice to have, all in a good cause, will look dapper in the gym" item. Emails to register your interest should be sent to sponsorship@rungeordierun.com with details of quantity and size. I anticipate the final cost will be around the £8 mark (plus P&P) with all profits going to the 2 charities. That's all profits by the way. Once production costs have been taken into account, every single penny will be passed to the 2 charities. And while I'm on the subject of production costs, none of this would have been possible without the help of David Fairlamb, Brian Wells and our friends at customplanet.co.uk. So don't forget, to avoid disappointment, please get in touch to register your interest at the address above and I'll let you know when the t-shirts are ready to buy. Monday 24th November - 5 mile run, Race Course. (00:43:00). Monday 24th November - 5 mile run, Race Course. (00:47:56). Tuesday 25th November - 5 mile run, Shotley Bridge to Ebchester and back. (00:55:09). Tuesday 25th November - 5 mile run, Race Course. (00:50:10). Tuesday 25th November - 5 mile run, Shotley Bridge to Leadgate and back. (00:59:15). Wednesday 26th November - 5.5 mile run, Pets Corner. (00:53:28). Wednesday 26th November - 4.5 mile run, Gosforth Round the Block and back. (00:45:09). Thursday 27th November - 5 mile run, Race Course. (00:47:12). Thursday 27th November - 5 mile run, Gosforth Round the Block and Back. (00:48:59). Friday 28th November - 5 mile run, Race Course. (00:44:58). Saturday 29th November - Beach Bootcamp. (00:45:00). Saturday 29th November - 8 x run up the steps. (00:15:11). Finishing the week off in some style! Despite the fact that I'm only 4 weeks into the USA 2011 training schedule, I feel like I've achieved a lot already. I've started to gain a basic level of fitness and endurance and the long process of putting the mental building blocks in place has begun. Apart from the very cold and hilly 15 miles I did on Tuesday the rest of the week has been quite easy. The week started with a PB for the 5 mile Race Course route (00:43:00) on Monday and finished with the 3rd quickest time this year on the same route on Friday (00:44:58). The times in between varied according to fatigue, temperature and terrain. I was hoping to finish the running week in style and I can most definitely say that, by my standards, I did that very thing. As I said in an earlier post, I've learned a lot from this week. The main thing is how to fit 50 miles into a week while working full time, doing the school drop offs and pick ups, having some good family time and still leave time to go to the match. I managed all of those things and could quite imagine being able to fit another 20 - 30 miles in per week. Quite how I'm going to add another 50-60 miles to that schedule by next Summer is going to take some planning. 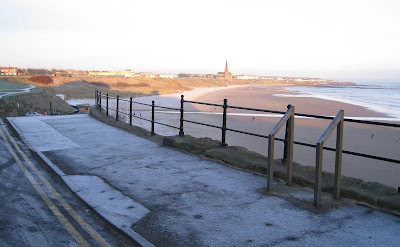 Not only did I finish my running week off in style, I also thought I gave a good effort at Beach Bootcamp and then on the steps at a very cold and icy Tynemouth beach on Saturday morning. I started the 45 minute Bootcamp session quite well and as a result of giving everything I had left I faded a little towards the end. The were a couple of new drills in Bootcamp this week and David made the most of the fact that the tide was way way out. Once the 45 minute session was over it was time once again to tackle the steps 8 times. After 50 miles of running and a tough Bootcamp session, part of me was hoping that the steps, like the rest of Tynemouth, would be covered in ice. We couldn't believe that there wasn't a hint of ice on them. Not a drop! Fellow "Bootcamper" Dan and I (pictured) led the rest of the group up the steps. There was absolutely no shortage of encouragement and the emphasis was very much on getting the technique right in order to distract from the burn in the legs. The first attempt was quite straight forward. Just like last week, though, there was little time for rest in between each set of steps. The next six sets of steps got more difficult each time and my legs felt more and more like jelly with every step. I think the week's effort had taken it's toll and I didn't quite know how I was going to get the last set in. Following a very brief moment to gather my thoughts, Dan and I set for the last time, with Ashley and David close behind. Within about 4 steps, I was completely focused on reaching the top. My mind was transported back to the 1/4 mile sprint finish I had on Thursday evening. And what music was playing on the iPod that particular evening? Yep! The Rocky soundtrack! I completely had the frame of mind from Thursday evening and with each step my current surroundings disappeared and I found myself in "The Zone". I love that particular place in my mind. I paid many a visit there on last year's run from John O'Groats to Lands End. Good things usually happen in this place. Take this snippet from 12th July 2007, day 6 - "All I could see were my feet and the immediate bit of grass on which I was running. I wasn't taking in any scenery. I wasn't aware of any oncoming traffic.". You can read all about it here but in a nutshell I'd had a tough 24 miles with 12, 13 and 14 minute miles all day. I finished up in the zone that day with a couple of 9 minute miles and the confidence to take into the following day's Cairngorm challenge. Anyhow! Back to the fourth flight on the 8th set of steps on Tynemouth beach! It was time to finish things off in style! I simply let loose with every last drop of energy I had and the end result was a canny bit of acceleration. I powered up the steps and I think I surprised a few people, including myself, when I got to the top so quickly. I didn't feel as tired as last week at the end either. The adrenalin was failrly surging around! I couldn't have finished the week off any better! Thanks must go to the gang for all of the supporting words as each step went by. Now, I think David might have something new planned for next week. There was talk of a new set of steps and a steep decline somewhere. I'll be spending all week, next week pushing myself as much as I can in preparation for that next challenge! The final 5 miles of the week which was the 3rd quickest this year took the tally up to a very pleasing 50. I've learned a lot from the week and will be discussing the findings with Mark and David at the earliest opportunity. Now for the highlight of the week - Beach Bootcamp! 45 done, 5 left for the week. And yet again I managed 2 more lots of 5 miles. That's 45 for the week so far. I'll be looking to finish the week off in style tomorrow with as much speed as I can muster. But for now it's an early night for me for it promises to be an early start tomorrow. Not for a run though. It's Jack's sixth birthday. I moved 10 miles closer to this week's target of 50 today. I'll put a full review on the site on Sunday. 15 miles on Tough Tuesday. It was an early start today as I got the first of today's three planned 5 mile runs underway. It was very cold in the Derwent Valley so I made sure I had more layers on than Adrian in Rocky I. After yesterday's PB I felt I had nothing to prove so I set off at a steady pace and the intention was just to make it through the day in 1 piece. I nearly came a cropper though when I skidded on some ice in Ebchester! I managed to do the 5 miles in 00:55:09. The time was irrelevant given the cold, dark and slippy conditions. The second lot of 5 miles, at lunchtime, proved to be much more difficult. Thankfully, I had Carl Hudson to keep me company and steer me round in a respectable time (00:50:10). My energy levels dropped to rock bottom after the 2nd mile and it was only a very long conversation about food that made the run bearable. Food like sausage rolls, chips and beans from Carricks when I was a kid and the contents of a 10 pence mix up were on the agenda. These days I rarely make the kind of carefully thought out and calculated decisions that I used to when deciding what to have in my 10 pence mix up! It was 10 pence. Not 11 pence or 12 pence. Just 10 pence. You only had 1 shot to get the contents of the mix up right. Would I put a 2 pence chew in there (like a Refresher) or would I go for 4 smaller half pence chews ? Oh the decisions you had to make as an....erm.....7 year old. Anyway, after all of the reminiscing about food the run was over. But why the lack of energy after 2 miles? I think this morning's porridge simply replaced the energy expended on the 1st run. I had nothing left for the lunchtime run and the deficit showed after 2 miles. A similar thing happened on the final 5 mile run of the day but the hunger and lack of energy wasn't as severe. I decided to head for the hills on this one where the 1st mile is a steep uphill out of Shotley Bridge. I haven't ran up that hill for a couple of years but it was so much easier than I remember. The final time was nothing to write home about though at 00:59:15. So that's 15 miles for the day and 25 for the week so far. I'm half way there! It's not only about the mileage though. I've gained some small idea of what training is going to be like on a daily basis from next Summer! Zikes! I've also discovered that the nutritional plan I've stuck to since September will need some adjustment before I undertake a day like today again. Incidentally, I ran 3 lots of 5 miles today to make up for the fact that I won't be able to do 1 of my 2 scheduled 5 mile runs on Friday when it's Jack's sixth Birthday! Thankfully, I'm back to a good old 10 miles tomorrow and then again on Thursday! I'll be aiming to finish the running week off in as much style as is physically possible with the final 5 miles of the week on Friday. Then with a belly full of jelly and ice cream (and probably porridge) I'll be looking for a good effort at Beach Bootcamp. 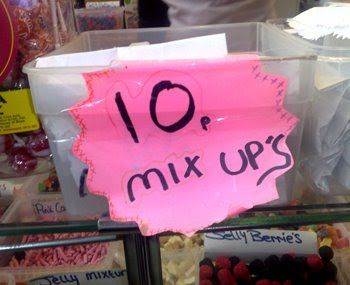 Then, if I manage 8 lots of steps again I may even treat myself to a 10 pence mix up for old time's sake. A superb start to a 50 mile week! It's back to basics time this week and the aim is to get 50 miles of running in. There'll be no room for the gym or any classes as I hit the road in time honoured tradition! Today saw me run the first 10 of those 50 miles in 2 separate sessions. As I mentioned on Saturday, I've felt a change in the last couple of weeks. The change is in my legs and arms as I really feel like I've got about 10% more power and strength than I had in September. I've started to see proof of this with heavier weights being used in Body Pump, a higher sustained heart rate in Spinning and the ability to cycle up the steep Condercum Road with relative ease! There was further proof at lunchtime today as I beat my previous PB for the 5 mile Race Course route by a second. Today's time was 00:43:00 exactly. The previous PB was set just a couple of weeks after last year's big run from John O'Groats to Lands End. I was in tip top condition then. So given that this is only week 4 of my USA 2011 training schedule, today's PB has served as a massive confidence boost. I followed that 5 mile run up with another one after work with about 1/2 mile of it in pitch darkness. I'm taking my torch next time! That didn't stop me from posting a very respectable time of 00:47:56. Even more pleasing is the fact that I managed both of these runs on a bowl of porridge for breakfast and a jacket potato and beans for lunch. And this is another area I'm starting to have more confidence in. Mentors David Fairlamb and Mark Fleming have guided me into eating the right things at the right time. I'm starting to realise that I don't actually need to eat an abundance of food to fuel all of the exercise I'm doing. I reckon my takeaway days are well and truly behind me. I must admit though that I'm looking forward to having a bacon sandwich on Christmas Morning. I know it's a month away but I've been thinking about it for weeks now. I've got it all planned out. Bacon (fried), tinned plum tomatoes and black pudding in a large Greggs Stottie. Great man! Anyway! (he says giving himself a hearty slap!). There are still 40 miles to get in this week before Beach Bootcamp on Saturday. I doubt there will be any more PB's. As David told me at the weekend, I'm well ahead of where I need to be. If I feel like I need a rest I should take one. There is no sign of needing a rest! Which is just as well as tomorrow is Tough Tuesday and I'll be running 5 miles before work, 5 miles at lunchtime and 5 miles before tea! Bring it on! Monday 17th November - 5 mile run, Race Course. (00:45:45). Monday 17th November - Spinning. (00:50:00). Tuesday 18th November - 5 mile run, Race Course. (00:48:48). Tuesday 18th November - Spinning. (00:45:00). Tuesday 18th November - Body Pump. (01:00:00). Thursday 20th November - 5 mile run, Race Course. (00:45:12). Thursday 20th November - Body Pump. (01:00:00). Friday 21st November - 17.7 mile bike ride. (01:38:54). Friday 21st November - 17 mile bike ride. (02:00:15). Saturday 22nd November - Beach Bootcamp. (00:45:00). 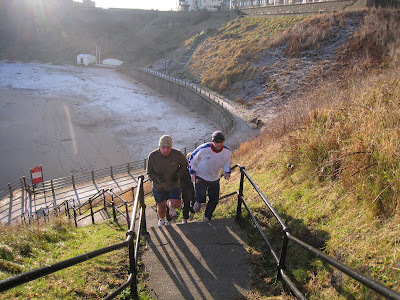 Saturday 22nd November - 8 x run up the steps at Tynemouth. (00:16:14). What do you make of the new logo at the top of this blog? It's a very professional looking version of the one I designed in the summer. Thanks go to Brian Wells for coming up with the all new and very dashing RUN GEORDIE RUN logo. This is the final version of the logo and will soon appear on the t-shirts that I train in. So when I'm in the gym, in a class, out running or at Beach Bootcamp I'll be able to effectively spread the word about the run. I'm currently working on some ideas to incorporate the logo into a kind of "Supporters of Run Geordie Run" t-shirt. If it's cost effective and a contribution to the 2 charities could be made they would be made available for purchase. Watch this space! The toughest test yet (until I did the next one)! I cycled to work in the freezing cold on Friday this week. I was particularly pleased with mile 13 which is a steep climb up Atkinson Road and Condercum Road until West Road. I usually get so far up the road and end up pushing to the top. This week was different however and I used my newly acquired leg strength and power to good effect. This wasn't at all bad for 07:30 in the morning either! Speaking of strength and power, I have noticed a change this week. As well as this cycle ride, I've been able to put more effort into the 2 Body Pump classes this week. I'm lifting heavier weights for the majority of tracks in the class. This is very encouraging, given that I'm only in week 3 of training! Back to the bike ride though and I could not feel my toes by the time I got to work and they were without doubt the coldest 17 miles I'd ever cycled! I didn't realise that 8 hours later I'd be doing an even colder and more difficult ride home! I set off at 17:30 and I didn't feel very well at all. I was sick a few times at the side of the road and it was either the fish from the canteen or a "spare" chicken tikka sandwich from Bow Monkey that set it off. Despite being well wrapped up, I was absolutely freezing and whenever my heart rate got up to a decent level my head started to pound! What a state! It took me 2 hours to get home but not once did I think of giving up and ringing Katy for a lift (well maybe once or twice!). I felt far from 100% and the conditions were bordering on dangerous. That bike ride was one of the hardest things I've done this year. 13 hours later, on a snow covered Saturday morning I felt much better and ready for Beach Bootcamp. It was the hardest session out of the 3 I've done so far but as enjoyable as ever. There is always plenty of opportunity to push yourself during the session and with plenty of encouragement from David Fairlamb I tried to go faster or put maximum effort in where I could. I say it every week but the initial 45 minute session flew over and it was soon time to tackle "The Steps"! 8 times again! And once again I was in great company with several of the folk from Beach Bootcamp in attendance. The first time up the steps was quite straightforward. I felt great at the top! But there was no time for hanging around in the cold so it was straight into the next effort. That was actually a feature of todays steps session. i.e. no recovery time in between efforts. Each effort brought more pain and burn in the legs. I stumbled slightly on effort 6. It was a bit like a boxer who goes down in the first round of a fight! It was a slip rather than a knock out blow! Effort 7 was the most difficult and I hardly had the strength to life my legs to the required height! Every time I even threatened to slow the pace down I felt a tap on my back pushing me on. Effort 8 required every ounce of concentration, determination and energy I had left to give. The burn on the final few flights of steps was incredible and when I reached the top I fell in a heap. This was no slip! It was a knock out for sure! Without doubt those 8 efforts were the hardest thing I've done so far this year. The whole session just about put yesterday's difficult bike ride into the shade in terms of both raw difficulty and the sheer determination needed to succeed. I just need to put in 90 minutes tomorrow to bring this week to a close but it all starts again as soon as Monday! Hmmmm.....time for a little adjustment! I'm into the third week of training and while things could hardly be going any better I'm just a little concerned at how little time I've got left in the week to spend with Katy and Jack. Currently, I don't get in until after 7:30pm four nights of the week and this doesn't seem right somehow. So it's time for a rethink! The first thing I'm going to try next week is to move 2 of the evening workouts to early in the morning! This is a big ask! A really big ask! But with 4 morning school drop offs per week there is an ideal opportunity to get 2 runs in somewhere beforehand. Tuesday evenings will stay the same with the back to back Spinning and Body Pump classes that form part of TOUGH TUESDAY. I think I'll keep Thursday evenings the same too with another Body Pump session. I'm actually starting to feel the benefit of those classes so it's important I stick at them. Friday's will still be a 34 mile round trip to work and back for now and of course I have 5 lunchtimes per week to make use of! I'll see how much more time this gives me with Katy and Jack and if further fine tuning is needed I'll make further changes. I'm sure, though, that it won't need too much adjustment to get the required 12 hours or so of exercise in while leaving enough family time. Quite how I'll manage to get 25 hours per week in by next Summer is something I'll have to really have a good long think about in the coming months. Watch this space! Meanwhile, this Saturday I'll be taking Jack to Beachkid Bootcamp at Tynemouth Beach. 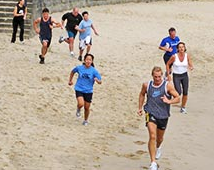 This session, of course, runs alongside the grown up's Beach Bootcamp! He then has tennis in the afternoon! His weekend activities are starting to resemble mine! Monday 10th November - Gym. (00:50:00). Monday 10th November - Spinning. (00:45:00). Tuesday 11th November - Spinning. (00:45:00). Tuesday 11th November - Body Pump. (01:00:00). Thursday 13th November - Body Pump. (01:00:00). Thursday 13th November - Tennis. (01:00:00). Friday 14th November - 17.7 mile bike ride. (01:34:13). Friday 14th November - 17 mile bike ride. (02:01:11). Saturday 15th November - Beach Bootcamp. (00:45:00). 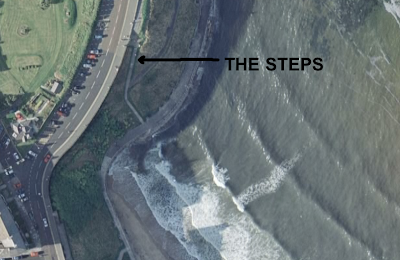 Saturday 15th November - 8 x run up the steps at Tynemouth. (00:17:17). 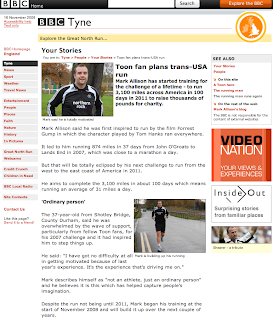 There is a great article over the on the BBC Tyne website about the USA 2011 run. It's not only a thrill but also a great honour to see news of the next big run on such a high profile site as bbc.co.uk/tyne. News of the up and coming 3000 scheme gets a mention. More news on that later this week! The article is bang on and mentions "And running is just part of his training regime so far. It also includes spinning, gym sessions, cycling and the tough-sounding Beach Bootcamp on a Saturday morning at Tynemouth.". The article can be viewed by clicking here. I've also added a link to the ever expanding "media links" section on the right hand side of this page. Thanks go to Rachel Kerr at BBC Tyne for her continued support and publicity. More steps in the right direction! It was once again to sunny Tynemouth Beach this morning for another Beach Bootcamp workout. There was another good crowd in attendance today made up of all kinds of ages and abilities. From the looks of it I reckon there were a few rugby players and a few runners in there as well as the casual keep fit enthusiast. Just like last week, the 45 minute workout was very enjoyable and I tried to put as much effort in as I could. I must admit that I did feel quite tired at the start due to the effort of the last 48 hours (running, cycling, gym and tennis) but I soon settled into today's routine where the majority of time was spent in the old pool area of the beach. Speaking of the pool I found this little gem of Miss Tyne Tees 1971. The event took place the month and year that I was born. It's well worth a nostalgic look by clicking here. The time flew over once again, probably due to the varied routines and drills we went through and before I knew it the class had come to an end. The majority of folk left at this point but a few stayed behind to have a crack at the steps in King Edwards Bay (pictured). Now picture that scene out of the Rocky movies. You know! The one where he runs up the famous steps at the Philadelphia Museum of Art. Now picture that scene 8 times! Yes, I ran up the steps 8 times! Each time I was accompanied by a different person. Each perso n pushed me (not literally) all the way. Pictured above is David Fairlamb and myself on the 8th set of steps. I was concentrating on swinging those arms and the rest seemed to fall into place. There was a definite improvement on last week and I've no doubt that this was down to the fantastic support around me. So thanks go to David, Ashley (who takes Beach Kid Bootcamp) and the other "bootcampers" for their help. Already, I can't wait until next week's session. Based on my experience of the last 2 weeks, for me, it is the icing on the cake. I've grafted for 11 hours this week (gym, running, cycling, tennis, spinning and body pump). It's great to have Beach Bootcamp at the end of it all to look forward to. And speaking, as I did earlier, about that famous scene from Rocky. Aside from emulating Forrest Gump's epic run across the USA I'd love, one day, to run up those famous steps. Yo Adriannn!!!!!! Accompanied by Ashley on the second attempt. Probably the last time I managed a smile on the third attempt! Discussing tactics for the next attempt. Rocky eat your heart out! Monday 3rd November - Gym. (00:45:00). Tuesday 4th November - Spinning. (00:45:00). Tuesday 4th November - Body Pump. (01:00:00). Wednesday 5th November - 8.4 mile run, Havannah Nature Reserve. (01:27:13). Wednesday 5th November - Tennis. (01:00:00). Thursday 6th November - Body Pump. (01:00:00). Friday 7th November - 17.7 mile bike ride. (01:37:13). Friday 7th November - 17 mile bike ride. (01:54:11). Saturday 8th November - Beach Bootcamp. (00:45:00). 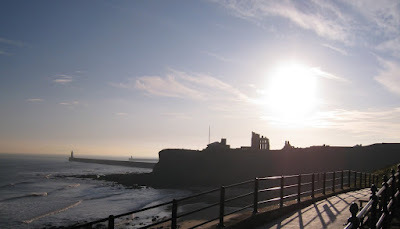 Saturday 8th November - 8 x run up the steps at Tynemouth. (00:35:00). I took part in my first "Beach Bootcamp" today on Tynemouth Beach taken by David Fairlamb. There was a good turnout for the 45 minute session which was made up of various components much like a circuit class. Unlike circuits, however, the surrounding beach environment is used as "apparatus". And I must say that it is used to very good effect indeed. The initial warm up consisted of a few laps of a section of the beach and promenade. Then it was into a rugby style drill, running around a marked out section of the beach passing a rugby ball. This required a bit of concentration, not only to find a decent pass but to ensure that I didn't run head on with someone. This drill was temporarily halted several times to enable other mini drills to be done and then the rugby style drill resumed again. During the first interruption, David took the opportunity to introduce me to the rest of the class and tell them what I was planning on doing in 2011. Time to breathe in! Other drills included running up the steps in the pool area of the beach with the emphasis on rhythm and arm work and another round of running up the steps on the prom. My favourite bits were to follow though. There were various interval drills between markings on the beach. I particularly enjoyed the jog to the first line, small quick steps to the second line, high knees to the third line and a sprint to the finish before jogging back one! Overall, there was plenty of variety in Beach Bootcamp, the time simply flew over and the difficulty level was just about right for me! Although, it is the kind of session where you can make it easier or more difficult and there are a few opportunities to rest. Not that I needed one! Honest! Despite being a cold and damp November morning, I was really surprised at the turnout. I'm guessing there were at least 20 people there. And on top of that, were the children who had turned up for "Beach Kid Bootcamp" which was taken by another instructor; Ashley. The morning's exercise didn't finish there though! After the class, David and I ran up the longest set of steps from beach to prom 8 times. This took about 30 minutes to complete and I must say that I've felt some burn in my time but none as much as this! My legs were like jelly by the end but by the time I'd got back to my car I felt all the better for the extra effort at the end. I would urge anyone who has 45 minutes to spare on a Saturday morning to make their way down to Tynemouth Beach for a really good workout. Further info can be found at www.davidfairlambfitness.co.uk. The question is, will I be back next week for another session? The answer is "Absolutely!". There was a nice plug today on Newcastle United fansite nufcblog.com. Thanks to Ed Harrison for the early publicity. The article can be viewed here. Now that I'm 4 days out of the comfort zone that was pre-training there is now a developing feeling that everything single thing that I do could have a knock on effect to the big run in 2011. I've made a decent start to training this week with the usual mixture of Body Pump, Spinning, running, Gym, Tennis and cycling to work. I'll be looking to get about 12 hours of workouts in before this week is out. The trick will be to do this again next week and the week after and so on! My aim is to be doing double that by next Summer with 110 miles of running per week. No wonder I'm able to steer clear of beer, curry and bacon sarnies! There is a real fear factor now and it wasn't here last week! As I said, I feel that everything I do, could have a knock on effect! Speaking of fear! I'll be cycling to work in the morning down the Derwent Walk Path at about 05:45 (Hopefully!). I've ran it many times. Even once or twice with no light whatsoever. 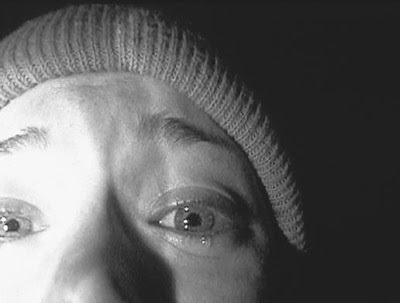 Thankfully, I've got some new lights for my bike so the Blair Witch had better watch out! To round off the first week of training, I'll be attending my first Beach Bootcamp on Saturday at Tynemouth. As I've mentioned before this is run by David Fairlamb (Fitness) and he's offered to do an hour of running up and down the steps on Tynemouth Beach afterwards! Yes! Afterwards! Expect a full report on Saturday afternoon! I had my 3rd body composition test on Friday. Despite losing more weight, the results weren't too good with fat weight up slightly and lean weight down. I'm not too concerned given that USA 2011 training starts in ernest this week. I have learned a lot about food recently and how I can change my diet for the better. And by diet I not only mean the quality of food but also the quantity, type and timing needed to support the different type of exercise that I may undertake. I have managed to sustain a decent diet for long periods. It's only during the last couple of weeks that I have become complacent. I think, knowing that the real training starts this week has led to a desire to have a few last chocolate bars. Mind you, I haven't been anywhere near a takeaway, beer or fry up for nearly 2 months. I'm taking the last set of results as a kick up the backside. Mentor Mark (Fleming) is very keen that I get under 100 kg as soon as possible. I'm only 3 kg off it, so if I put in the effort I'm hopeful of getting to that weight prior to 2009. I did confess to Mark during Friday's weigh in that I had scoffed a huge cream scone (pictured) 2 hours prior. I didn't half pay for it during the hour long workout in the gym afterwards. I was shaking at the end! So that's that. Absolutely everything I do for the next 2 and a half years really counts towards the final result in 2011. There is so little room for complacency now. Quite appropriately, I happened upon this little gem on t'internet. It is as if it was written with the USA 2011 training in mind. I'll be heeding the advice on offer. "There will never be a day that will not require dedication, discipline, good judgment, energy, and the feeling that you can improve. Each day offers an opportunity for improvement." AUCTION ITEM - Bond, James Bond! Up for auction this week on eBay is a 96 page charity programme from the premier of Casino Royale in 2006. Hopefully, it's sale will raise a few bob which will be added to the USA 2011 Tour Fund. Ending this week is the Adidas Team GB tracksuit worn in the 2004 Paralympic Games in Athens. This item currently stands at £50.01. Fingers crossed that the final price is a bit more. Watch out for more interesting items in the coming weeks.